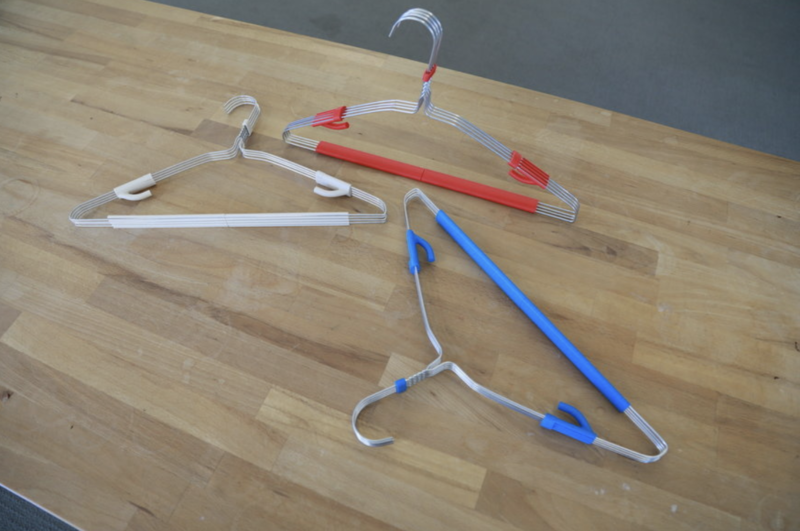 For MakerBot’s 2018 NYCxDESIGN 3D Printing for Smarter Living Challenge, Industrial Designer and Director of Parson’s MFA Industrial Design program Rama Chorpash selected dry-cleaning wire garment hanger proliferation and blight as his focus. With little public consciousness, approximately 3.5 billion garment hangers go into landfills annually. Nearly all community-recycling programs do not accept them as they jam machinery and pose risk-of-injury to workers. Produced of a single, thin gauge, steel wire, the hangers have a short life span and damage clothes left for extended periods of time. Rarely do they find reuse in users’ homes or in a closed-loop return and reuse dry-cleaning circuit. From worldwide supply chain to individual’s closets wire garment hangers pose a significant problem. Chorpash’s The Great American Clip Hanger (GACH) combines standard wire hangers into durable, reusable goods that can accommodate heavier jackets or pants and strap dresses. While desktop printing may not solve the ongoing throw away culture of the ubiquitous dry-cleaning hanger, Chorpash’s design offers a whimsical way to capitalize and reclaim this waste — creating potential and possibility.